You can also purchase thru BarnesAndNoble.com and Amazon.com. "Let's make BIG things happen!" Mr. Penny. Remember 100% of all proceeds from the sale of Mr. Penny and the Dragon of Domeville: The Story of Us go to retire America's National Debt! Our beloved Country is in trouble�big trouble. This is the kind of trouble that cannot be solved unless we all pitch in and come to the aid of our Country immediately. And the good news is that we are empowered to do just that NOW, thanks to one American citizen, Susan Vaughan Clayton; one Congressman from Florida, Charles Bennett; and one American President, John F. Kennedy. Together, they forged the original Partnership for America's Future and initiated Public Law (P.L.) 87-58, which empowers every American citizen today, regardless of age, to make voluntary contributions of money to the Country on the condition that these contributions are used only to retire the existing principal of the National Debt. What we cannot do alone, we can do together. The power is in the numbers and with over 313 million citizens in America, the small contributions of individuals do add up. The contribution of one person, multiplied by the positive contributions of others, all acting in agreement, accumulates into serious change. This is the change that Mr. Penny brings about in this inspiring and uplifting story of the power that one healing vision and one willing heart have to unite the little people into courageous action for the good of all. Mr. Penny and I invite you to get rollin', America! Welcome to the future of your choice! And just in case you were wondering, all proceeds from Mr. Penny's heroic story will go directly to retire the principal of the National Debt under P.L. 87-58. Buy this book to give to your kids and grandkids and to give them a brighter future. Lucile McConnell, the author, will donate all after-tax royalties to retire America's National Debt under Public Law 87-58. Learn more about voluntary contributions to retire the Debt or contact Lucile. America's New Day Begins with Us! Igor Malov is one of the most renowned artists in the country of Ukraine. He was born in Russia in 1936. His family immigrated to Ukraine shortly after World War II. He graduated from Kiev Institute of Arts in 1966. He has been producing art in many media for over 50 years. He specializes in watercolor painting, as he finds it the most challenging of all techniques. During his career, he practiced industrial design and holds many patents on his work. Now in retirement, he is doing oils, watercolors and illustrations. He lives in Kiev, Ukraine with his wife, Olga. The twenty-one illustrations in Mr. Penny and the Dragon of Domeville are reproduced from original watercolors by Igor Malov. Once upon a penny, in the Land of Us, in the little town of Meville, lived a little penny. In fact, whole lot of little pennies were scattered all over the land of Us, but our story is about one particular penny: Mr. Penny. He was a singular fellow, quite an individual and not a follower of the crowd. He had circulated far and wide, but had never lost his shiny side. Mr. Penny knew anything could happen and never knew who he would roll into next. 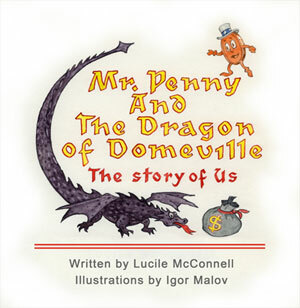 Join Mr. Penny and all the pennies of Us in Mr. Penny and the Dragon of Domeville: The Story of Us.